The other day I saw something called the stump stove. This is a good example of taking advantage of someone. It is a small log approximately 6 to 12 inches in diameter and up to about 20 inches high. It comes in different sizes. There is a hole cut halfway through the center. The idea is you light it on the inside and it burns for several hours. You can cook over it and as it burns down it becomes a campfire. The principal is not bad. 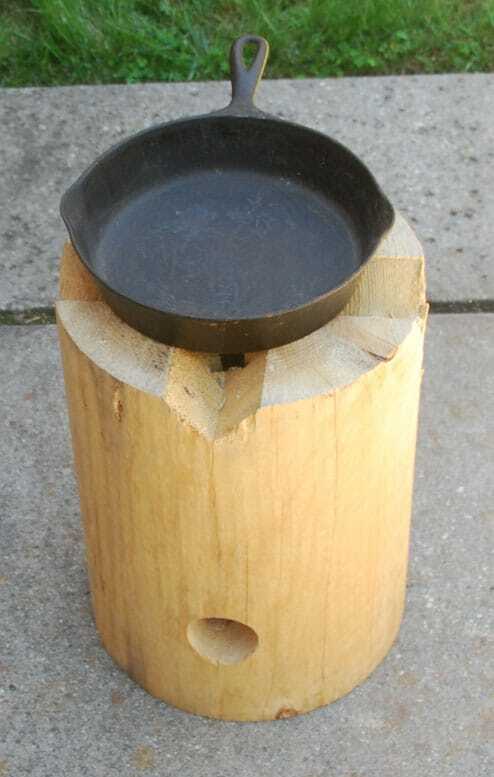 It is similar to the rocket stove and will burn as advertised. If you made your own out of free wood it will work in a fixed camp site. They seem to have found buyers for these logs, I saw one the other day. Take a look at the pictures. It is a simple idea that will cook your food, but the cost is ridiculous. If you want to see them just look up stump stove on the internet. Stump stove from top, notice cuts in top that connect to vent hole in side. 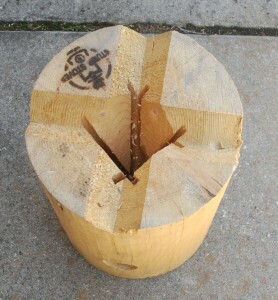 This entry was posted in cooking, Uncategorized and tagged Howard, Stump Stove. Bookmark the permalink. Haha! I’m swedish and back home we have been making theese stoves for centuries! It’s an amazing invention and one of the first things you learn when joining the army. takes less than 5 min to make one so don’t waste your money!